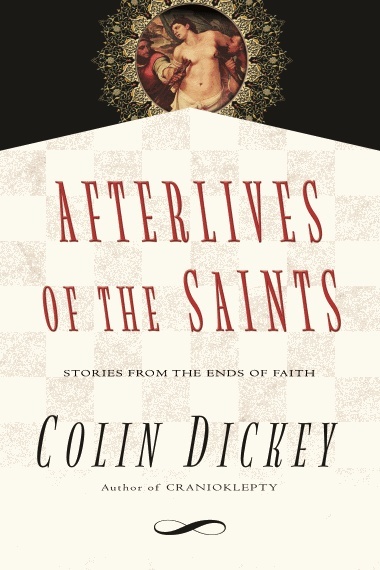 In Afterlives of the Saints, Colin Dickey— author of Cranioklepty—presents us with a history of faith as told through some of the strangest stories of the saints. These are saints who murder, saints who gouge out their own eyes and hold them out for inspection, saints who minister to the petty and the bizarre and the maligned. These are saints who, when visited in a contemporary context—as saints in the cities—actually enlarge our concept of faith. With a lively intellect and fresh insight, Dickey reveals that we can no longer experience the world as did the saints who once walked amongst us. Today, such ascetics, pushing their bodies to the edges of experience, would be labeled with all manner of clinical diagnoses: masochism, anorexia, schizophrenia. The old pathways to sainthood are clearly incompatible with modern life. In our world, such practices are pathologies. And yet, these saints have become a creative engine by which we can tap into the rich attraction of excess, while safely observing a kind of superhuman insanity. Colin Dickey retells their stories, not as a theologian, but as someone trying to understand the ways of the world. This is how the end of the world looked in the sixth century: In Gaul, above the River Rhône, a “curious bellowing sound” was heard for sixty days before a hillside collapsed. In Auvergne in 571, a plague that decimated the population was preceded by “three or four great shining lights” that hovered around the sun. There were eclipses and comets and birds that flew into churches, miraculously extinguishing every candle “so quickly that you would have thought that someone had seized hold of them all at once and dropped them into a pool of water.” On November 11, 578, during a celebration of mass in Tours, “a bright star shining in the very center of the moon” appeared. In 580, floods devastated the region, and a sound “as of trees crashing to the ground” was heard for fifty miles in every direction. The signs were everywhere. A fi re in Paris in 585 burned everything but the churches of Saint Martin and Saint Germanus. In the ruins, a mysterious bronze statue of a snake and a rat was found; when it was removed, the city became infested with snakes and rats for the first time. In April 586, an epidemic decimated Tours and Nantes, death proceeding rapidly from a slight headache. In the town of Limoges, those conducting business on the Sabbath were consumed by fi re, while elsewhere in France a drought destroyed acres of farmland. Men sold themselves into slavery to get something to eat. In Chartres, people discovered their jars inscribed with characters they could neither remove nor read. Shortly thereafter, new grapevine shoots appeared mysteriously in October, along with deformed grapes. Flashes of light shot out from blood- red clouds; snakes dropped from the sky; entire villages disappeared. The Messiah appeared and reappeared, and reappeared. A man named Desiderus emerged in Tours in 587, calling himself the Savior and offering to cure the paralyzed and the crippled, forcibly stretching out their bodies as he called on his divine power; those he did not cure were sent away, half dead and broken. In Gaul, plague broke out, and during the epidemic a woodcutter was attacked by a swarm of flies, went insane, and proclaimed himself Christ. He attracted some three thousand followers and began his own plague of banditry: He and his followers robbed everyone who passed on the road and gave what they took to the poor. After a few months, he took his army to lay siege to the cathedral; once he was there, the bishop sent out emissaries claiming to be peace envoys— when they reached this Christ, they summarily executed him and dispersed his followers, torturing any who remained. Another man claiming to be Christ was arrested and jailed without protest. Shortly thereafter he broke out and escaped to the local monastery, whereupon he promptly passed out, dead drunk. When the bishop of Tours found him the next morning, he smelled so bad the bishop could not stand to go near him. Unable to get his attention, he tried to wake this Messiah by singing as loudly as he could. Let your first image of Gregory be this: singing hymns one morning in 580 to a passed- out Christ. Imagine him the singer, singing the end of the world. Colin Dickey is the author of Cranioklepty: Grave Robbing and the Search for Genius. His fiction and nonfiction have appeared in Lapham’s Quarterly, Cabinet, TriQuarterly, and The Santa Monica Review. He is also co-editor (with Nicole Antebi and Robby Herbst) of Failure! Experiments in Aesthetic and Social Practices. A native of the San Francisco Bay Area, he now lives in Los Angeles. Author photo by Seth Sherwood.